COMPANY PROFILE Power Grid Corp Of India Ltd is an electric power transmission company. The Company is engaged in the transmission of electricity, power system management, telecom and domestic consultancy. The Power Grid Corporation of India is an Indian state-owned electric utilities company. The company is in the power transmission business with the responsibility for planning, implementation, operation, and maintenance of the Inter-State Transmission System. The Government of India is a majority shareholder. However, the company also has telecom and consultancy businesses. The company’s telecom business is providing connectivity to a variety of metros, major cities, and towns. The company’s consultancy services are extended to clients in India and internationally. A majority of revenue is derived from transmission charges. Customers include State Governments, State power utilities, and other clients. All revenue is derived from India. 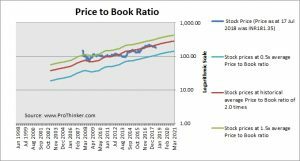 At the price of INR181.35 as at 17 Jul 2018, Power Grid Corp Of India Ltd is trading at a Price to Book Ratio of 1.7 times current book value. 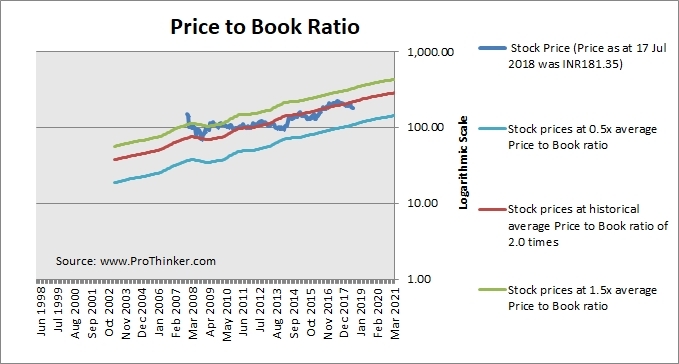 This is a 16% discount to its historical average Price to Book Ratio of 2.0 times.